Kathleen Kelly Janus is a social entrepreneur, author, and lecturer at Stanford University’s Program on Social Entrepreneurship. As an expert on philanthropy, millennial engagement and scaling early stage organizations, her work has been featured in the Wall Street Journal, Huffington Post, Stanford Social Innovation Review, Tech Crunch and the San Francisco Chronicle. Her book “Social Startup Success: How The Best Nonprofits Launch, Scale Up and Make a Difference” (2018) is a playbook for nonprofit organizations based on a five-year research project interviewing hundreds of top-performing social innovators. An attorney, Kathleen has spearheaded numerous social justice initiatives. Kathleen is a co-founder of Spark a network of over 10,000 millennial donors – which seeks to advance gender equality by engaging the next generation in accessible forms of philanthropy. As a teaching fellow at Stanford Law School, Kathleen helped launch and direct Stanford Law School’s international human rights clinics in Namibia and South Africa. She has also served as pro bono counsel at Covington and Burling and a litigation associate at Thelen Reid & Priest. 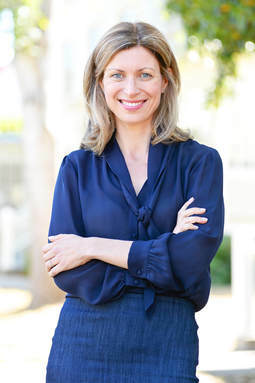 Kathleen is currently the board chair of both Accountability Counsel and Cow Hollow School. She informally advises dozens of other nonprofits, including the Stanford Social Entrepreneurs in Residence. In 2014, she received the Laura Arrillaga-Andreessen SV2 Social Impact Award for her commitment to philanthropy. A graduate of Berkeley Law School, Kathleen also graduated with highest honors from U.C. Berkeley. She lives in San Francisco with her husband Ted. Kathleen is a certified yoga instructor, which comes in handy when juggling their three young children. For availability and speaker fees, please contact Kathleen Kelly Janus’s speaking agent at Chartwell here, or call +1 972 385 1021 for U.S. inquiries or +44 207 293 0864 for international inquiries. Social Startup Success from Stanford PACS on Vimeo. Stanford Social Innovation Review Data on Purpose 2018 - Closing Keynote from Kathleen Janus on Vimeo.